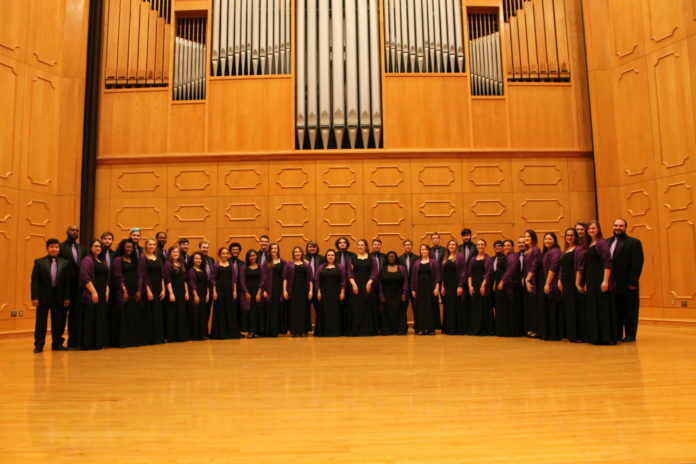 The Northwestern State University Chamber Choir has released a new CD, “For a Breath of Ecstasy,” which is available on a number of popular music sites. The choir is conducted by Dr. Nicholaus B. Cummins. The title work, which premiered on March 3, is a seven movement work for choir and chamber orchestra by composer Dr. Michael Trotta. “For a Breath of Ecstasy” was commissioned by Cummins in honor of Dr. Greg Handel, director of the Mrs. H.D. Dear and Alice E. Dear School of Creative and Performing Arts and interim dean of Arts and Sciences. The chamber orchestra consisted of faculty members Andrej Kurti, Leah Forsyth and Sofia Tchetechlasvili and students Jonathan Andino and Alonso Restrepo. The project was funded by the Lenn Prince Endowed Professorship in Voice. The recording was released several days ago and debuted in the Top 50 classical recordings on iTunes. This is the first internationally released album by the Chamber Choir at Northwestern State. It is available at Amazon.com, Spotify and other websites. “For a Breath of Ecstasy” will also be available on Naxos in the coming months. In addition to the seven movement work, there are three separate pieces that are available on the recording performed by the Chamber Choir, Cummins said. The Chamber Choir plans to release another recording on iTunes next fall as a compilation of the first three years of recordings from 2015-2018, according to Cummins.